I stumbled on these two plastic cases of embroidery thread at the thrift store the other day. They were tucked in the grab bag section of the store where miscellaneous threads and lace and zippers are sold. It is one of my favorite places to dig through because what has been deemed not worthy to sell alone is zip locked together to add value by volume. 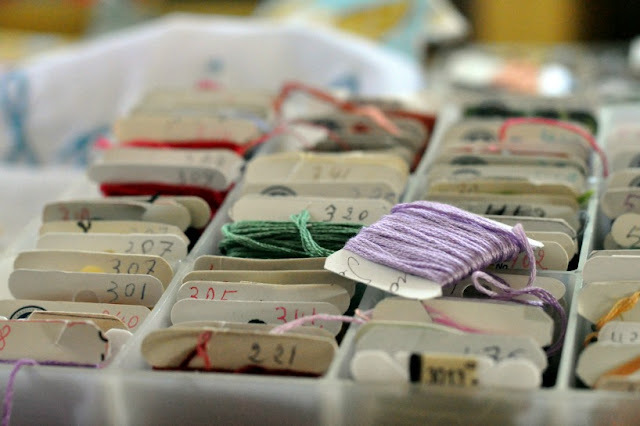 I find bags full of jewelry beads and vintage spools of threads and antique lace for a couple of dollars all the time. I almost didn't notice these at first. I didn't see past the dingy plastic containers and nearly missed the treasure inside. 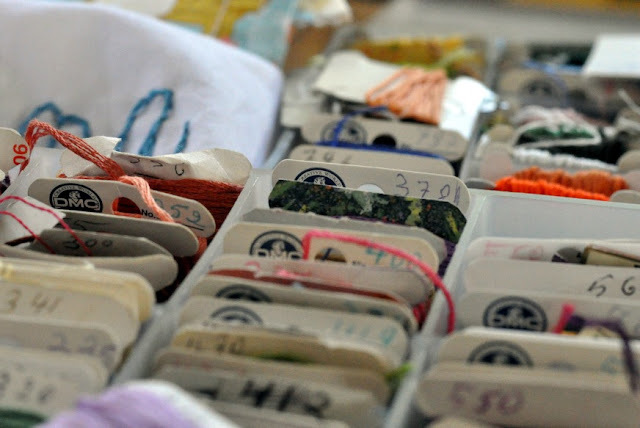 Some dear lady (I imagine her older because of the wavering scripted numbers) lovingly wound and labeled the floss and organized them all by number. She even had a color chart that I am sure she referred to all the time. I imagine the countless nights she spent creating beauty from these simple strings...the samplers and pillow cases she gave lovingly as gifts. Did she pass away or did her eyes just grow too dim and her hands too unsteady? I wonder who in her family felt it was time to drop them off at the thrift store along with worn out shoes and out of season blouses. What an honor it has been for me to thread these pretty colors through a needle and begin to create new beauty to share. I wish I could tell her how much I love her little boxes of string and how glad I am to continue to bring joy with my hands, a little more beauty to the world and to preserve even a small part of her memory. Don't you just love rescuing items you know were lovingly cared for by someone else at one time? I too wonder those same things. Especially when I go to Estate Sales. Love those as well! I am just finishing up my "first" designated Craft Room. I have been having so much fun bringing out all of my crafty stuff. I am also adding things that have belonged to my Mom and my MIL. Would love to have you stop by for a visit when you have the time and check out my new space. Love your post today! What a "treasure trove" of floss!!! Yes...this took hours to wind the floss, number and then catalog. I know, because I still have my one plastic case in Studio One. So~o~o glad you rescued this and are continuing to use these items! One never knows what treasures are in the hidden places! Great post!!! I loved reading your post and I felt a sisterhood bond. I collect old mixing bowls and one of the things that attract me to them is the thoughts of all the ladies before me. Mixing batters, making potato salads, and letting their dough rise for bread. Part of the fun of using them is the day-dreams that go along with the use. I guess that is why I hang on to old family items . . . they have so much love in them. I would have never thrown out my mothers threads, but created a collage or at least found a family member who loved sewing and passed them on. One persons junk is another's memories, or treasures. Thank you for sharing this story and for the lovely photographs. Have an amazing and art filled day. It always seems a little sad to me that works of art end up in the thrift and garage sales. 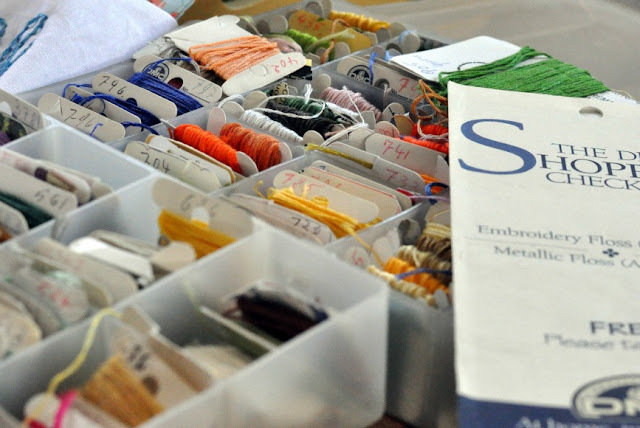 On the other hand, they get a new life when people like us, who appreciate the work that went into them, rescue them and repurpose these beautiful things.Maybe the items she used the threads for were kept and treasured, but in non-crafty hands they would be unused anyway. You've got me tearing up. I was going through a drawer yesterday and came upon a sweater that my mother knit for me. It's too small, but I think of her knitting and I keep it for sentiment's sake. I think it needs to go to one of my young cousins and have an active life again. It's a beautiful pink wool. Thanks for a lovely post! Wow! 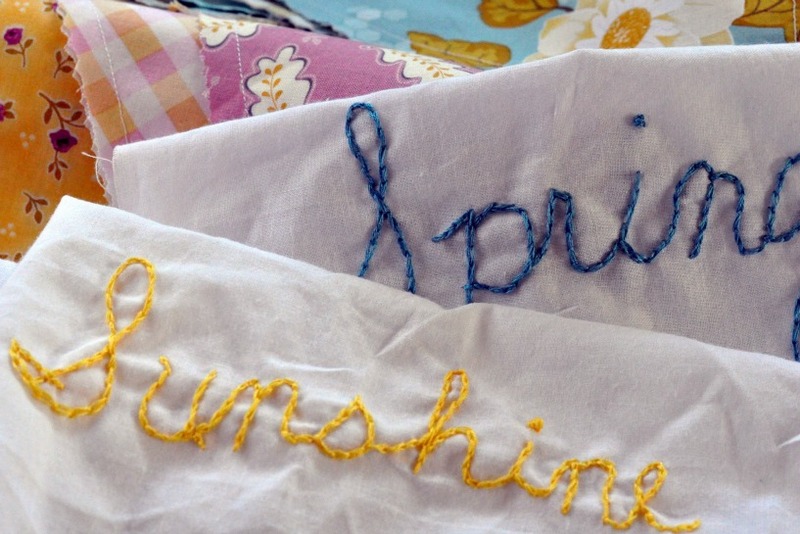 I have my older embroidery threads just like that...my sons...when they were just little helped me wind them...you just brought a smile to my face reading that...I use mine all the time but haven't wound new ones in years...Have a great evening! What a thoughtful and sightful post. Whoever once worked with that floss and treated it with such respect would be pleased to know that someone new, who is kind and considerate and appreciative of her work, is carrying on where she left off. Lovely! Thank you for sharing not only your wonderful find.... but your kind and caring spirit. It's the best kind of find Patty! So special!! Ahhh...Patty, what a sweet, thought-provoking post! I almost felt like crying. I am a huge romantic and don't like letting go of the past. When I am driving down country roads and see old fence lines on farm lands in need of repair, I find myself thinking those same thoughts. Where is the farmer now all these years later who put all the hardwork in to putting that fence up or I see an old, old beautiful tall shade tree on those fence lines, and wondered about the shade it provided for that farmer...did he stop for a rest in that shade or did his little farm wife ever come running out with a picnic lunch for him and they settled under the tree for a minute or two for refreshment and delight in each other's company?? I think we have a lot in common in reminiscing! :D. Another one I reflect on are the pioneer days...imagining stretches of tall grassy fields versus cities! And the pioneers and their covered wagons.... LOL! So silly I know, but I enjoy it! I feel the exact same way about handmade items. I always have projects going. I give them as gifts. I enjoy it so. I'm sure when I leave this earth, Goodwill will have an avalanche of threads, yarns, buttons, and many other materials and kits. Hopefully, someone will feel about my things as we feel about others'. What a sweet post, Patty. What great treasures that you found. 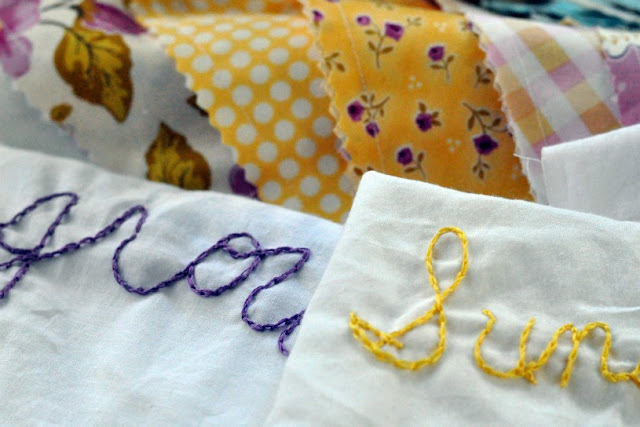 I always love finding handmade treasures and I too wonder about the person who created them... Enjoy your day. Love this post, what an awesome find. I love looking at the hand writing as well! This is the first post from your blog I have ever read, and it touched my heart. I believe that thread found its way to the perfect person!